Your session experience with Wendy Sorensen Photography actually begins before the session itself. I want to assist you every step of the way to make this process as easy and stress-free as possible. We'll start with a pre-session consultation where we can meet at a local coffee shop (my treat!) to start planning your session. From location options in the Des Moines metro area, to what to wear, and tips to help your kiddos (and husband!) have fun, we'll cover it all and get to know one another too! Newborn pre-session consultations are handled a little differently since they are mainly lifestyle in nature. We generally meet at your home since that is where the session will take place. That way we can work together to decide which rooms to photograph in, and also determine the best spots in your home for gorgeous natural light for your baby's photographs. During the warmer months we can definitely consider outdoor locations if you prefer. Where in your home you would like to display your photographs? At the consultation, you can look at various samples including canvas gallery wraps, mounted prints, metal prints, albums, and card samples. You won't need to make any decisions on which products you want at the consultation, but it helps to have an idea of what you have in mind. Knowing which rooms you want to hang wall portraits in will help me know how to photograph for your specific wants and needs. For example, if you know you want a large piece over the couch or fireplace in a formal living room, you may want a traditional posed shot of everyone looking at the camera. Or, if you're looking to add wall art to a casual family room, candid/emotive shots may be the way to go. Do you have an open floor plan without a lot of wall space? Albums are a fantastic choice to consider! At the session itself, you can relax and have fun while I work! We'll spend the first few minutes getting comfortable with each other and having fun. Most sessions last approximately 60-90 minutes and are either scheduled 90 minutes before sunset, or about 30 minutes after sunrise (are you an early riser??). Newborn sessions range anywhere from 2-4 hours to allow for ample time for feedings, diaper changes, and soothing your baby. Approximately 2 weeks after your session we will schedule your own personal Reveal Night and Ordering Appointment - this is the best part! I will bring a dessert for you to enjoy while you view your photographs for the first time in a slide show set to music...just sit back and enjoy the show! After the slide show I will assist you in selecting images for your prints, canvases or album. 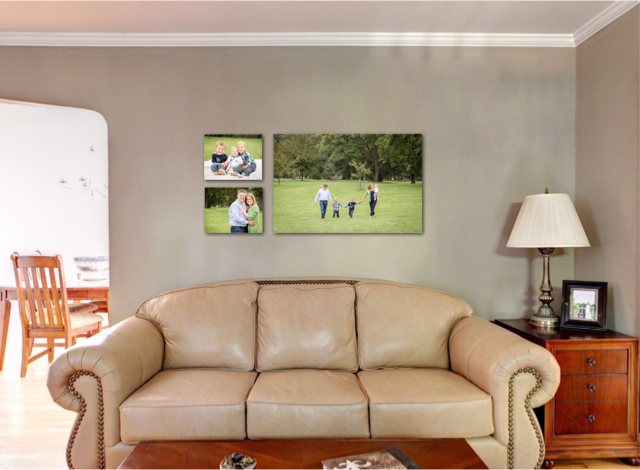 You can even see how your photographs will look on your own walls with a digital wall design gallery - YOUR photos, on YOUR wall, with YOUR furniture and decor, at the right size. It's a fantastic way to "try before you buy"! To see more samples of digital wall designs click here. Placing a portrait order can feel overwhelming with so many choices, but I will be there to help you every step of the way. Once your order arrives (usually within 2-3 weeks) I will hand-deliver it to you! Now that you have a feel for what a session is like it's time to talk about the numbers. Click on the Investment button below for pricing information.